J&A performed preliminary and final design of a complete Wastewater Collection and Treatment System for this town of approximately 600 residents. This cost-effective, environmentally friendly treatment process consisted of a dual lagoon system, multiple duckweed cells, UV disinfection, and a wetlands percolation area. J&A spearheaded the effort to obtain project funding through 5 state and federal agencies. Additional tasks included funding compliance audits, construction administration, and resident inspection. Severe erosion along an existing creek was undermining the stability of buildings and parking lots, and created scour holes up to 18 feet deep. 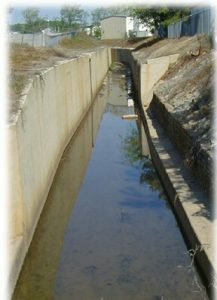 J&A performed a HEC-1 computer analysis of the site conditions, developed alternative solutions, recommended a preferred solution, and prepared construction documents for this channelization and bank stabilization project. 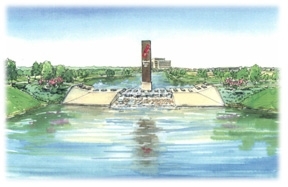 Cummings Research Park West is the second largest Research Park in the U.S. J&A was selected to design a 24 acre lake, concrete fountain and spillway, as a signature water feature of the Park. 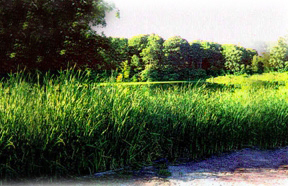 The lake also functioned as regional retention basin for a large part of the Park. Project construction required approx 600.000 cy yards of soil excavation. Working with City staff, J&A developed a construction process that saved over $1M in earthwork cost, and generated revenue through the sales of the materials.